 15 "As far as I'm concerned, it was never meant to be a documentary," says filmmaker D.A. 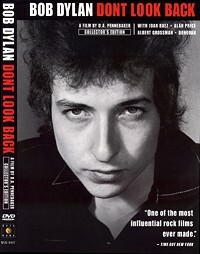 Pennebaker on his 1967 masterpiece, Don't Look Back, a feature film dedicated to Bob Dylan, which was filmed during Dylan's last acoustic tour in 1965. During a three and a half-week period of time, Pennebaker traveled with Dylan, filming over twenty hours of footage and editing it down to the final 96-minute length.  15 15"I don't like [documentaries] much," continues Pennebaker. "To my mind, the most interesting filmmaker that I ever knew about was Robert Flaherty, who made Nanook of the North. It was about this Eskimo, and Flaherty didn't try to tell you everything there was about the life of an Eskimo. He just wanted to show you what it was like to be with an Eskimo for a little bit.  15 15"And that's the feeling I tried to put across. I was never interested in educating people about Dylan. First of all, I don't know enough about him. Who does? Besides, that's Dylan's business. If he wanted to educate people, I'm sure he knows how to do it. What I wanted to do was just be present when Dylan enacted his whole life and show you what he deals with and what interests him."  15 15Hailed as the greatest documentary of its kind, not all critics embraced Pennebaker's unusual style out-of-the-gate. Known as "Cinema Verite", Pennebaker avoids using traditional interview techniques or extensive archival footage, preferring to capture action as it occurs. And for the first time ever, it is available on DVD with several bonus features.  15 15The DVD version, released by Docurama, contains five original, uncut audio performances not found on the original version, including "It Ain't Me, Babe" and "To Ramona." The original theatrical trailer also finds its way onto the DVD, as do things like Pennebaker's filmography, Dylan's discography (which is quite fun to browse through for novices and collectors alike), and biographies of the cast and crew. Pennebaker and Dylan's tour manager, Bob Neuwirth, also give their thoughts on the tour and film, providing background commentary that is both enthralling and enriching.  15 15For me, however, the highlight of the DVD is the video for "Subterranean Homesick Blues". The video opens the film, playing in its entirety, setting the stage for the epic masterpiece Pennebaker has created surrounding Dylan, just like in the original. With the wonders of technology however, the never-before-seen outtake of the classic cue card scene is now available for the public to witness. Just as witty and brilliant as the film version, this one has even more flair to it, making it charming beyond belief. If you weren't a Dylan fan before seeing it, than there is something obviously wrong. However, after seeing it, you'll be convinced - how could you not be?  15 15Pennebaker's cult classic and mainstream success has turned music fans, critics, musicians, filmmakers, and the public's head for nearly thirty-five years. Now it is time to see it again, for the first time, and marvel at the digital transferred, crisper version on your DVD player.